Dorit Aharonov, David Gosset, and Thomas Vidick did standup for three-and-a-half days in La Jolla earlier this year. They are not listed among the many distinguished actors who have performed at the La Jolla Playhouse on the UCSD campus. Nor were they observed by any of the Hollywood talent-search agencies in town, at least not that we know. 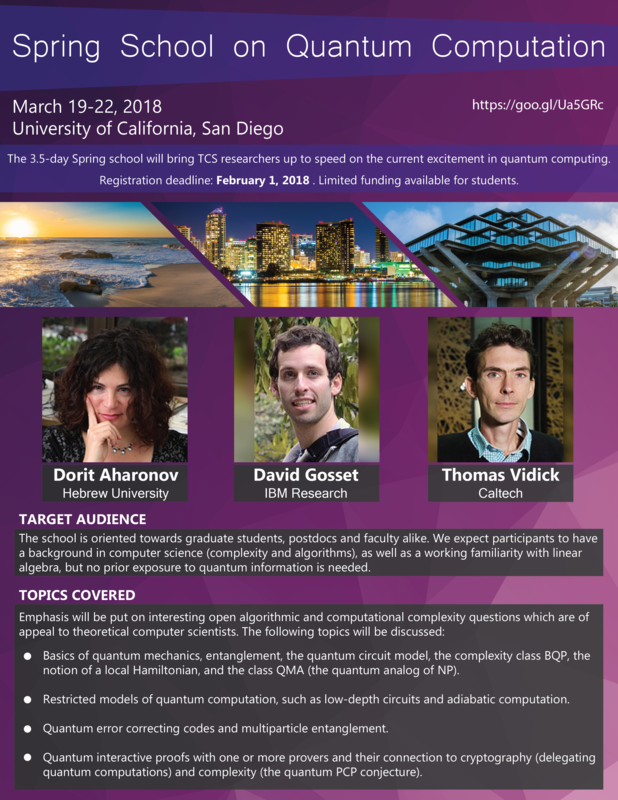 But they were applauded by numerous computer science and physics students attending the the March 19–22 UCSD “Spring School on Quantum Computation” which they led. Today we report on the meeting and discuss an important problem springing from condensed matter physics: the Local Hamiltonian (LH) problem. Local Hams were proved to be “quantum -hard” by Alexei Kitaev almost 20 years ago. Intervening years have shown even greater resonances between problems about quantum Hamiltonians and complexity classes. William Hamilton didn’t know about quantum but he did know about energy, which his Hamiltonian operators capture in both the classical and quantum worlds. He is of course the person we CS people know for Hamiltonian cycles and paths, and his quaternions have even figured into CS books like this on computer graphics. But he meant a lot more to physics. The lectures seemed tailored toward physics students—but perhaps that is because our reporter who attended the workshop is a computer science PhD student. He is Chaowen Guan, being supervised by Ken at Buffalo. This is our introduction of Chaowen writing for the blog, and we turn to him for the main body of this post. This makes an eigenvector of with eigenvalue . The more witness predicates satisfies, the higher . In Hamilton’s terms, the system gets more “excited” by such and is the energy of the resonance. Note that when we just had one witness predicate the eigenvalue was for all witnesses. So we could just add up for a bunch of witnesses and the resulting vector still satisfies with the eigenvalue . But with multiple we can only do this for the same , so we have to stratify the space according to each . Abstractly, this is just rehashing basic facts from linear algebra about eigenvalues and their corresponding eigenspaces. But we gain relevance to complexity, even though is exponentially big, when is succinct—and when we work with “witnesses” of more-piecemeal things that are local. For instance, for each clause in a 3CNF Boolean formula , make by putting in a for each assignment that satisfies . Since only the three literals in matter, is the tensor product of an diagonal matrix with the identity on the other variables. If we add up and , then tells us the number of satisfied clauses. We can play the same game with unsatisfying assignments instead—then with -CNF we put in only one per clause regardless of . So the matrices are super-sparse as well as “ “-local. If we think of as an operator on those variables then we can sum them up without the technical crutch of saying we are really summing the matrices . Now to do this when qubits stand for the variables we need to fix what “NP” means in the quantum world. , (Q accepts ) . Here is a quantum state of size at most . If we take as a classical witness but leave to be a quantum verifier, the class Quantum Classical MA ( ) is defined. Given: A set of -local Hamiltonian operators, each of operator norm at most with entries specifiable by bits, and real numbers and such that . Question: Is the minimum eigenvalue of the Hamiltonian on qubits smaller than , or are all eigenvalues larger than ? For any , this can be thought of as the quantum analog of -SAT. From the above discussion and MAX-2-SAT being -hard we can already see that the -LH problem is -hard for any : By representing the variables by qubits and each clause by an acting on qubits, the vector of a satisfying assignment to any one will have eigenvalue 0 while an unsatisfying assignment corresponds to eigenvalue 1. Therefore, the lowest eigenvalue of the sum (recall that we really mean the sum of the corresponding matrices) corresponds to the maximum number of simultaneously satisfied clauses. Getting hardness for requires some more work, however. The following was originally proved for the constant value of , but was brought down to 2 in this paper by Kitaev with Julia Kempe and Oded Regev. The -local Hamiltonian problem is -complete. To prove it is in , an obvious witness for a “yes” instance would be simply an eigenstate with eigenvalue smaller than . For a “no” instance , the amplification theorem can be used. The proof for -hardness is more complicated, so we will discuss only the main difference from the standard Cook-Levin proof. A natural witness for the history of the computation would be the sequence of states and we want to verify the consistency of two consecutive states via local means as with the Cook-Levin proof. The issue is that it is possible in quantum for two vastly different states to give the same local appearance on all subsets of qubits. A simple example for and is that the entangled state gives the same coin-flip on one individual qubit line as the unentangled superposition of all four basis states. In general the issue is that the scalars and will come out the same when and have the same reduced density matrices on -qubit sets and yet could be different states. Hence, this can facilitate the comparison between and . One can refer to the survey mentioned above for a detailed proof of this theorem. This paper gives a list of other known -complete problems. To prove -completeness for , a technical tool named projection lemma had been used, which enables approximating a non-local Hamiltonian by a local Hamiltonian. The same paper also provided another self-contained proof for using a more advanced tool, perturbation theory, to analyze sums of Hamiltonians. Day 1: The talks covered the basic background on quantum mechanics and quantum computation, mainly including the physical principles of quantum computation, the quantum circuit model, some basic quantum algorithms such as factoring, and the introduction to LH problem. Dorit presented the quantum version of Cook-Levin theorem, proving LH is -complete and gave an overview on quantum error-correcting codes. Thomas spoke on delegating computation of encrypted quantum data to “quantum cloud”. David spoke on the adiabatic model of quantum computation. Thomas discussed the topics on quantum multiplayer games. David spoke on the advantage of shallow quantum circuits over classical computers and topics on more restricted models of quantum computation. Dorit discussed the quantum PCP conjecture and the NLTS (standing for no low-energy trivial states) conjecture. See also this paper which came out just before the workshop. Thomas discussed more on the formulations of quantum PCP conjecture and the entangled-prover interactive proof systems. David gave an overview of stoquastic Hamiltonian problems. After lunch there was a discussion of open equations and challenges. More details and materials of the talks can be found on this page. Fault-tolerant quantum computation with constant overhead: Currently there is a poly-logarithmic overhead. A paper by Daniel Gottesman showed the possibility of creating fault-tolerant quantum computation with constant error rate and constant overhead by using a family of low-density parity check (LDPC) codes. A recent paper motivated by Gottesman’s work claims that the family of quantum expander codes can meet the requirements (stated here), but this paper also mentions that additional analysis on syndrome errors needs to be done before these codes being employed in the construction in Gottesman’s paper. Hence, the construction of such a family of quantum LDPC codes still remains open. I really enjoyed your post Chaowen!! I especially liked the example with 3CNF Boolean formulas in the section “Putting Energy Into NP”. Is open problem #1 really Unique Games Conjecture? I thought that the quantum version was solved some time ago https://arxiv.org/abs/0710.0655. Maybe there was some confusion with quantum PCP conjecture, that is still open in the quantum case. It’s also worth mentioning Open Problem #2 saw major progress on arXiv very shortly after the workshop ended: https://arxiv.org/abs/1804.01082. See also a great recorded talk by the author here: https://simons.berkeley.edu/talks/urmila-mahadev-06-15-18. Thanks for the comment. The open problem is updated. The third open problem is also solved in a follow-up to https://arxiv.org/abs/1711.08351 to appear at FOCS’2018 (but not yet available on arXiv). The property that was missing in the previous paper was a proof that the decoding algorithm still works well in case of a noisy syndrome. Great post! A question: As NP (or rather its circuit analog) is often described in terms of non deterministic Boolean circuit, is there a simple such description for QMA (or a non-uniform analog) in terms of non deterministic quantum circuits?